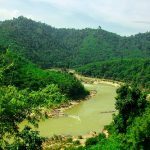 Backyard Travel, the online boutique tour operator specializing in insider tours throughout Asia, today announced an exciting new tour through Southern Myanmar. This new adventure traverses some of the country’s lesser-seen terrains, introducing travelers to the region’s cultural and historical treasures, and treating them to breathtaking scenery. This four-day, three-night Dawei and Southern Myanmar tour begins in the city of Mawlamyine on Myanmar’s stunning Andaman coastline. Over the course of the trip, it winds its way down the coast to Thanbyuzayat, the terminus of the Death Railway, before heading to the picturesque town of Ye to explore temples and take in unspoiled mountain and river views. In Dawei, travelers will be immersed in local history, learning about the town’s colonial role and visiting prominent Buddhist sites. A visit to a local cashew farm and family pottery business provide further insight into this charming riverside town.